I am really excited to be linking up with Katie at Mummy Daddy Me capturing the ordinary moments in life, I love reading Katie’s blog and it’s lovely to now be able to join in. Today we went to visit my nan, she is 95 years old and lives in a lovely home about 45 minutes from us. My nan is a large part of who I am and I love the relationship we have. I was lucky that until two years ago, when she became to old to travel, my nan spent every christmas with us and the memories I have will stay with me forever. 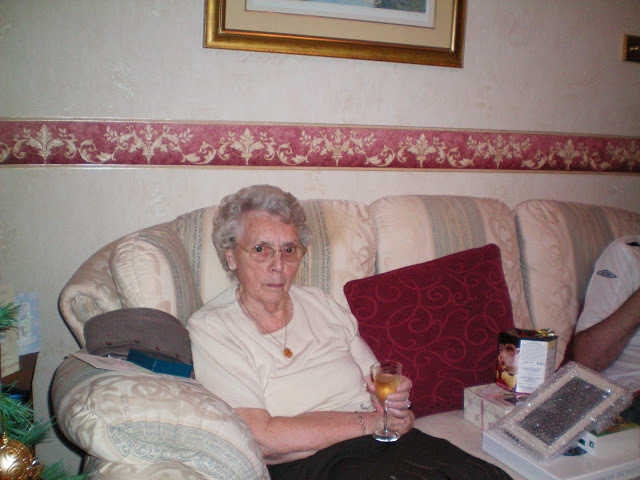 She came on our family holiday every year until I was fourteen and during the school holidays I would go and stay with my nan on my own….which I loved. On a Sunday I would stay up late and watch Come Dancing whilst we ate our walnut whips. When I had Alice, it was important to me that she had a relationship and got to know and love her great nan, we go and visit her often usually with my mum. 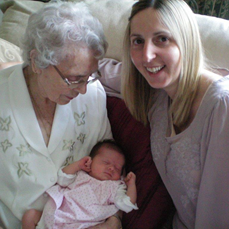 When my nan moved to a home two years ago, that didn’t stop me taking Alice to visit and when Holly arrived I took her to meet her great nan when she was 9 days old. My girls love going to see great nan and Alice thinks that her room is ‘her house’ and I love that. It’s not always easy keeping two active girls entertained in a small room, but that doesn’t matter to me and won’t stop me from going. I take along toys, puzzles and sticker books and they both love showing great nan what they have brought along. I love sharing photos I have taken of the girls and telling stories of what we’ve been up to and listening to Alice tell Great Nan about her trip to the dentist or going on the train, melts my heart. Alice has her own special way of sharing stories and seeing my nan smile, well it’s perfect. Holly is at an age where she doesn’t remember people that she hasn’t seen in the last couple of weeks, but she never cries when we arrive, just quietly sits on my lap watching her whirlwind sister. It’s not long until she jumps off my lap and is taking her toys to show great nan. I know my nan loves our visits, its not always easy for her to have reached the fantastic age of 95, but spending just an hour or so with my girls brings some fun and laughter into her world for a while and I’m pleased we can do that for her. Afterwards we pop along to the local garden centre for lunch, as this means I can stay a bit longer with my nan and it’s become our little routine that we have come to love. It’s so important to me that my girls enjoy days like this, simple family days, as much as they enjoy going to local attraction parks and soft play with their friends. And when my little Alice tells me as we get in the car to leave ‘I love coming to see great nan’, I think I must have done something right. Previous Post: « Hello…is anyone out there?